One of the thing I really like about this project is that Stan has been forced to find a way to make the songs work on ukulele. In some cases they translate well without too much fuss, in others Stan has had to creatively use a looper pedal in order to construct the right sound. Learning to play the uke actually a totally unexpected thing. During the early days of been in my band Bud Sugar, we were all quite versatile so we would switch up instruments whilst jamming. I borrowed this cheap ukulele from my step dad Pete, I think it was for a photo shoot or something. I had no intention of playing it as it was constantly going out of tune. However my mate Bax tuned it up and he managed to get to stay in tune enough to play this chord sequence. He wrote this song called Ya Life’s Happening, so of course in usual Bud Sugar style we would pass around the instruments. And it just stuck to me like glue. I became a bit reluctant to pass it on haha. So from that point on I was the uke player in bud sugar. Most of my uke videos are prepared in the same way. First things first I will listen to the album in full and pick out a section from each song that I feel embodies the whole song. Usually it’s an opening riff or a vocal chorus. Next I will prepare my backing track, you know like the drums and bass. I use Logic Pro X to produce and record everything. It’s a great piece of software for any aspiring musician as you can do everything in it. After I have my backing track and the all the songs transition nicely into each other, I will start to figure out how to play them on my uke. Usually this is the most testing part of the process as 95% of time I’m learning it by ear as I’m sure everyone’s aware, there’s a lack of ukulele tabs online. I’ll sometimes look at the guitar tab and then transpose into a uke, I’ve usually got a guitar handy to do this. So after all the songs have been figured out I will record each part and get to work on learning to play them all in sequence ready for filming. 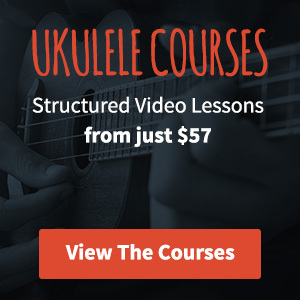 Depending on how many uke tracks I have, I will usually perform live however on some of the more elaborate songs I would play along to my pre recorded uke. The main reason for This is time, and my lack of it. So after I’m comfortable playing through the whole thing, It’s time to film. I use my wife’s Canon 550d, she recently got me some lights too so I have a pretty decent filming set up at the min. Once I have everything on film I take all the footage into After Effects to edit. I use After Effects as I feel it gives me the most control over what I want. I know it can be sluggish and rendering can be a nightmare but I just feel most comfortable using it. Then voila it’s done and ready to upload! I should also mention that I use Kala ukuleles, I’ve been very fortunate to be endorsed by them so I got this pretty sick Kala Comfort Edge a few weeks ago.